Watching horses perform at liberty is often described as magical. Those who practice this type of training will tell you that asking a horse, who is bound to you only by respect, trust and playful curiosity, to perform a task and having him comply is humbling. But, in truth, there is no magic involved; it’s a matter of time, patience and understanding. There are numerous benefits to working with horses at liberty. Not only can you have fun playing with your horse in this manner, you can also learn how to communicate more effectively, introduce new things and refine movements. All of which will help solidify your relationship on the ground and in the saddle. A horse is “at liberty” when he is free of tack and, therefore, free to leave the lesson at will. Any time is a good time to begin liberty training. Young horses who are not physically mature enough to be ridden, retirees, injured or insecure individuals, as well as perfectly sound and fit horses enjoy this type of learning and interaction. Winnie and Bill Stott of Nobleton, Ontario, purchased a pair of weanling Lusitano colts in 2004. While the pair was not experienced in rearing youngsters, they understood the importance of starting their education early on. Having met and worked with a couple of trainers who specialized in playing with horses and training them to do “tricks,” Winnie’s imagination began to run wild. To start, she invited a trainer to come out and teach “the boys” – Zelador and Zeloso – how to bow. She took over from there. Since those early days, Winnie has taught the boys, as well as the horses who board at her farm, a wide variety of games and tricks, which they proudly display for adoring fans that come to visit the farm and at fundraisers and special events. She eagerly devours input and information from other trainers and behaviour experts, and delights at coming up with new challenges for them, and for herself. So far, their repertoire includes games like playing fetch and catching toys, identifying objects and people, rolling out a carpet, opening a mail box and playing instruments. Some can also lie down and sit on command, and play horsey versions of soccer and baseball. Trainer Jutta Wiemers, of Vancouver, British Columbia, is the author of From Leading to Liberty. She describes her niche as “playing with horses,” which she became interested in when she was trying to find a way to keep her senior horses, Peter and Beau, active and enriched in retirement. “Many horse lovers find themselves in the same situation: what to do with a horse who has served you well for your riding, but is physically not able to do so any longer? He is still willing, but his joints ache. Selling him would break both your hearts, and being a lawn ornament is extremely boring. We can’t keep our horses from ageing, but we can increasingly employ their minds, where the body fails,” she said. 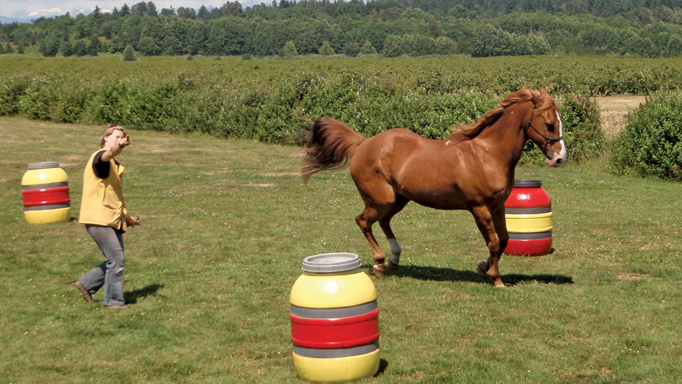 Jutta teaches horses and their humans how to communicate better through “games and circus gym exercises, which maintain the body, while developing the mind.” In addition to her book, she has produced a three-part series of Playing with Horses DVDs. Winnie has also used liberty work to instill some basic lessons that have served her, and her horses, well when it came time to start work under saddle. Further, with her love of classical dressage, she taught both horses to piaffe and to perform the Spanish Walk at liberty. She waited until they had a firm grasp of the movements before she put a rider in the saddle. “I can’t imagine working with a horse under saddle without this marvellous liberty work first,” said Winnie. “With the piaffe, for example, we started in the stall. Both Zelador and Zeloso started learning how to pick up a hind foot, hold it, then put it down. Jutta also uses liberty work to enhance groundwork training, teaching horses exercises like “parking,” which “in a nutshell, would be like ground tying,” she said. “Your horse reliably stays where he is put until released.” Another exercise she practices is called “strategic feeding,” which “teaches the horse to follow your hand gently with good manners, so you can position his head where needed.” Another very handy exercise is called the “bring back,” which trains the horse to come back to the handler no matter how near or far away they are. It takes a certain kind of person to excel at liberty training. To be successful, you must have the right combination of patience, kindness, perseverance, timing, imagination and horse sense. You must be willing to re-evaluate when things don’t go according to plan and make a new one on the spot. 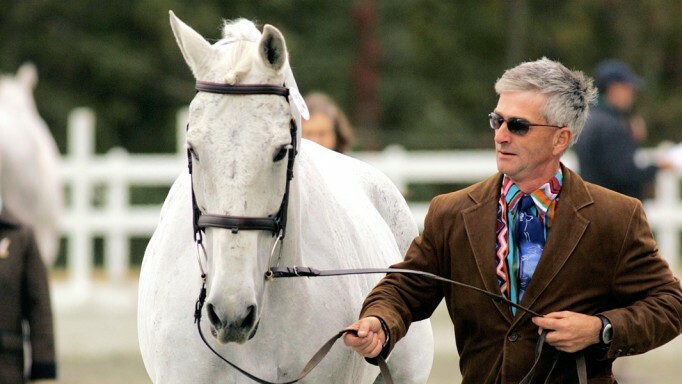 If you are willing to put in the effort, though, not only will your connection with your horse strengthen, but you will grow as a trainer as well. There are several factors which contribute to successful liberty training. An understanding of horse speak, or equine body langue, is key. Using appropriate body language yourself, and knowing how to read your horse’s, can facilitate communication and keep you both safe. When starting out, many trainers prefer to work in a small, confined space, like a round pen, with minimal distractions. As the training progresses, you can move to larger, open spaces to test your connection. Highly trained and enthusiastic liberty horses will choose to stay with their trainer against almost any distraction. The use of positive reinforcement is, undoubtedly, a very strong motivator in liberty training. 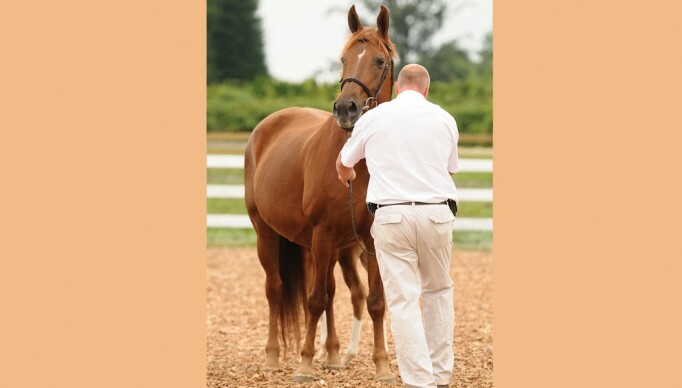 This method involves rewarding the horse when he performs a desired behaviour. Trainers use a certain, distinct signal – like the sound of a clicker or a word, like “yes” or “good” – to mark the behaviour they want, the moment the horse performs it, then offer a reward (food, scratches or praise). This use of operant and classical conditioning, which trains the horse to associate good things with the sound of the clicker, for example, lets the horse know instantly when he has done the right thing. The addition of a pleasant reward ensures that the behaviour is more likely to happen in the future. Positive reinforcement through clicker training is most successful when applied using the principles of shaping. Shaping refers, essentially, to breaking a behaviour down into smaller segments and rewarding successive approximations (behaviour that is close to the desired response) until the actual desired behaviour is achieved. As the steps begin to come together, you stop rewarding each small segment and only reward for a finished job. Take retrieving, for example. The steps might include first getting your horse to touch or “target” an object (click/reward); tossing the object a few feet away and walking him to it (click/reward); asking him to lower his head (click/reward); getting him to target the object on the ground (click/reward); enticing him to take the object in his mouth (click/reward); walking him back to the starting position (click/reward); and encouraging him to drop it (click/reward). After numerous successive trials, you will be able to reduce the number of times you click and reward until finally you only do so when your horse completes the entire task. “Through training with positive reinforcement and following the laws of shaping, the horse learns to learn,” noted Jutta, who has created her own system, which she calls H.E.M. (Help, Explain, Motivate). “This method is developed in such a way that one learning step follows another, always building on something already understood by the horse. There is no end to the possibilities when it comes to liberty training. The only limit is your imagination. Horse-Canada asked equine psychologist, Antonia Henderson, to share her thoughts on liberty training from a scientific perspective. Q: What are the benefits of working with horses at liberty? A: In terms of developing a partnership, I don’t believe that there is anything particularly magical about working with a horse at liberty vs working under saddle. It may be that liberty work appears to enhance the horse/human bond because it is more likely to include positive reinforcement in the training. Under saddle training, on the other hand, is almost exclusively based on negative reinforcement (something aversive, such as pressure, ends when the desired behaviour is performed, making it more likely that we will see that behaviour in the future). Also, the bond may be solidified simply because owners are likely to spend more time with their horses when they include liberty work into their daily routines. Almost all groundwork training (liberty or otherwise) will serve to enhance work under saddle. I think of it as the “transferable skills” that we would talk about in workplace parlance. 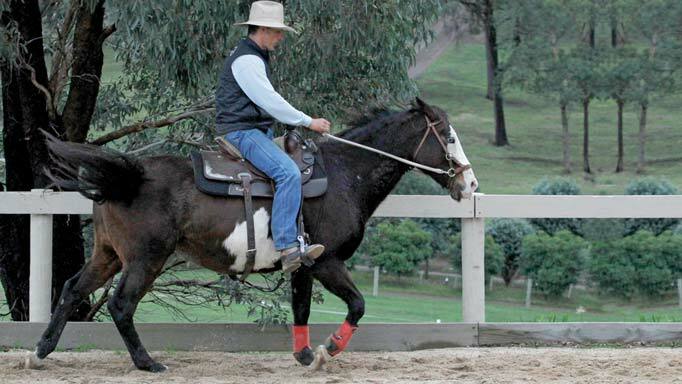 Liberty work teaches a horse coordination and balance as well as to be tractable, manageable and attentive – all critical transferrable skills for work under saddle. Q: What is the best approach to working at liberty? A: There seem to be a number of different approaches to working with horses at liberty, and various philosophies about the use of food rewards, round pen training, the importance of body language and so on. I train horses at liberty using positive reinforcement, beginning in a smaller area with fewer distractions and gradually working towards my horse focusing on me even in an entirely open setting. My goal is for my horse to discover that it works out better for him to hang out with me than to be anywhere else. This can be achieved with either positive or negative reinforcement. Both work, but positive reinforcement is more fun. Negative reinforcement tells the horse he has made the right choice when a consistent pressure (chasing, whip pressure, even verbal pressure), eases and becomes neutral. In positive reinforcement we tell the horse he has made the correct choice with a reward (food, scratches, inviting body language, etc.). Most of us prefer to work for the good stuff. I suspect that horses are not so different. 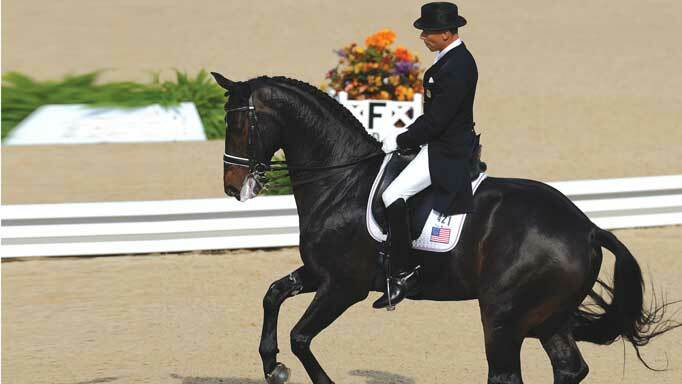 Q: What role does body language – of the horse and of the trainer – play in liberty training? A: I don’t think the body language rules are any different for a horse at liberty than for one in the cross ties or a box stall. Most of us are aware of what a friendly horse looks like and that is the behaviour we want to see in working with our horses in any situation. A primary rule that my horse has to understand very early on when we are out there running around together is that I am not his equine playmate. Since horses seem to naturally enjoy liberty work, a clear way to show that a behaviour is unwanted is to end the fun at the first indication of any sort of play that could be potentially dangerous. With any unsolicited pushiness, nipping or heels in the air, I respond with a very business-like body language and put the horse away for a time out. They get it very quickly. Ending the fun is an effective punishment to eliminate an unwanted behaviour. I think many of the natural horsemanship and liberty trainers have done a good job in figuring out what postures horses find threatening or inviting. Many of them couch this in terms of understanding the horse’s soul and connecting with that place within ourselves. The scientist in me sees it more parsimoniously. Body language is yet another tool that can be used in the art of operant conditioning – as reinforcing to make it more likely for a wanted behaviour to reoccur, or as a punitive to reduce or eliminate an unwanted behaviour. Q: Have there been any behaviour studies on liberty training? A: I have not found any scientific literature on liberty training specifically, although a few equine behaviourists have written about round pen work. Dr. Konstanze Krueger, from the University of Regensburg, in Germany, conducted a study in order to explore Monty Roberts’ concept of “join-up” where horses in a round pen choose to follow the trainer. She found that horses who were chased by a trainer in a round pen, did learn to follow a trainer over subsequent trials, and required less and less chasing over each trial. All the horses eventually learned to follow immediately without chasing. Interestingly, in Dr. Kruger’s study, trained horses did not generalize this behaviour when at liberty with other horses in a pasture setting. Given the choice of following a trainer or eating grass with their herd mates, all horses previously trained to follow a trainer in the arena setting, chose the latter. Dr. Kruger’s findings seem to contradict what we see with much liberty training, which does take place in open spaces, and with several horses at a time. In these instances, trained liberty horses apparently choose their trainer over the more tempting alternative of pasture and friends. I would love to see research that explored liberty training in a controlled environment to investigate if indeed trained liberty horses would consistently make this choice, and if so, why.